For additional information about Kestrel’s capabilities and services you can request additional information. 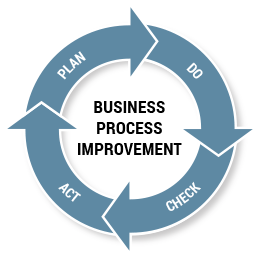 A good organization applies good processes and improves them over time. Successful and sustainable businesses adapt to changes in their markets, economic situation, technology, and regulations. This requires sustained efforts and disciplined management and strategies to ensure that business processes are constantly improving. Rather than simply managing crises effectively, process improvement makes operations more efficient and reliable and helps prevent unwanted surprises. It involves evaluating how work is performed, and then focusing on opportunities to eliminate waste — money, people, materials, time. Process improvement does not begin with the assumption of capital investment. Rather, it begins with optimizing existing operations and then using that knowledge to develop a strategic investment plan. Kestrel excels at translating strategy into execution, using process as the critical link to help organizations realize measurable results. By fully understanding processes, we are able to help make changes that reduce variation and remove activities that contribute no value to the end product/service. We help companies decide on priorities for change, and then implement efficient business processes that our clients can manage on their own. And we always maintain our focus on increasing efficiency and reliability without sacrificing quality, capacity, safety, or environmental responsibility.